Her er en lille gave til dig: Opskrift på hvordan du kan være kreativ når du har meget lidt tid til overs. En Creative quickie er en lille øvelse jeg opfandt da jeg var nybagt mor til barn nr. 2, og barn nr. 1 samtidig led af voldsom børne eksem. Min tid og energi til at være kreativ blev med et drastisk skåret ned, men ideerne blev ved med at komme, og jeg blev meget frustreret over ikke at have mulighed for at handle på dem. Hvilket altsammen hverken hjalp mig eller mine børn. Måske er du selv i en situation i dit liv lige nu hvor energien og tiden til at være kreativ ikke er helt som du kunne ønske? Eller måske har du bare lyst til at lære en fin lille øvelse der kan få selv de mest stivnede kreative juicer til at flyde igen, stille og roligt? Har du blot 5 -10 minutter, kan du selv lave en Creative Quickie som den du ser her. Det er en slags kreativitets medicin. Indtages i små doser, gerne dagligt. Modvirker frustration over nul tid og energi til at skabe, og åbner for inspiration og handlekraft. 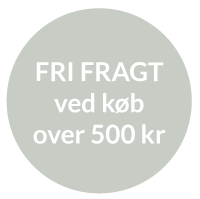 Alt det kræver er: et ugeblad, et hvidt stykke papir, en limstift, en tusch, samt viljen til at risikere at være pinlig/ skør/ lidt for meget. 1. Bladr igennem et ugeblad eller hvad som helst med billeder i, som det er ok at klippe og rive i, og klip eller riv 1 – 3 billeder ud som af en eller anden grund taler til dig. Prøv at undlade at tænke over HVORFOR, bare riv dem ud! 2. Placer dem tilfældigt på et hvidt stykke papir med en limstift. Jeg bruger selv en notesbog uden linier, men du kan sagtens bare bruge et hvidt stykke papir. 3. Tag en dyb indånding, og skriv så hvilke som helst ord der lige kommer til dig. Det kan være et enkelt ord eller hele sætninger. Hvis du har lyst, så kan du også tegne lidt kruseduller/ former på siden. Du kan bruge alle slags skrive redskaber, men selv kan jeg bedst lide at bruge en permanent marker så jeg også kan skrive henover de blanke blade. Nyd friheden: ingen behøver se dette, det er kun for dig! Det var det! På denne måde kan du skabe dine egne små ”drømme-bærer-sider” og vide at på blot 10 minutter har du både været kreativ OG holdt dine større kreative drømme i live indtil en dag du har mere uforstyrret tid og energi til at handle på dem. Hello new year – hello transformation and new visions! ….Yes, I love it when we honor our sincere wish to make life count, and when we use creativity as a tool to make that happen. That is why I, in the beginning of every year, work with my visions in words and pictures. That is why I create Vision boards. 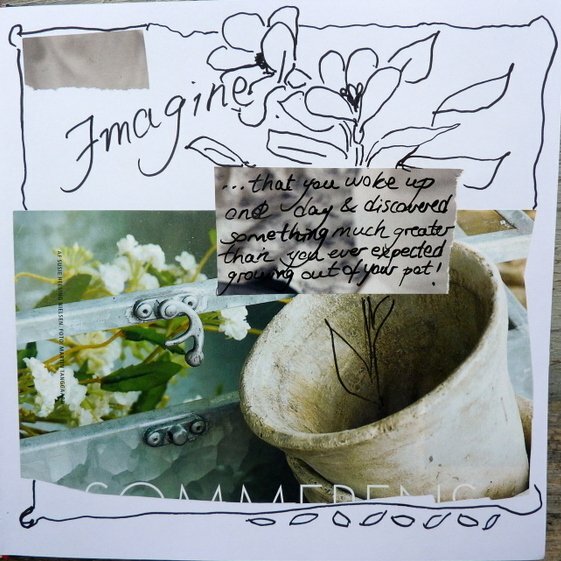 And that´s why I love teaching Workshops using that and other creative tools. This year, however, it seemed like an uphill process. At least at first; no inspiration, no joy. No feelings of anticipation when trying to catch my visions for 2015. 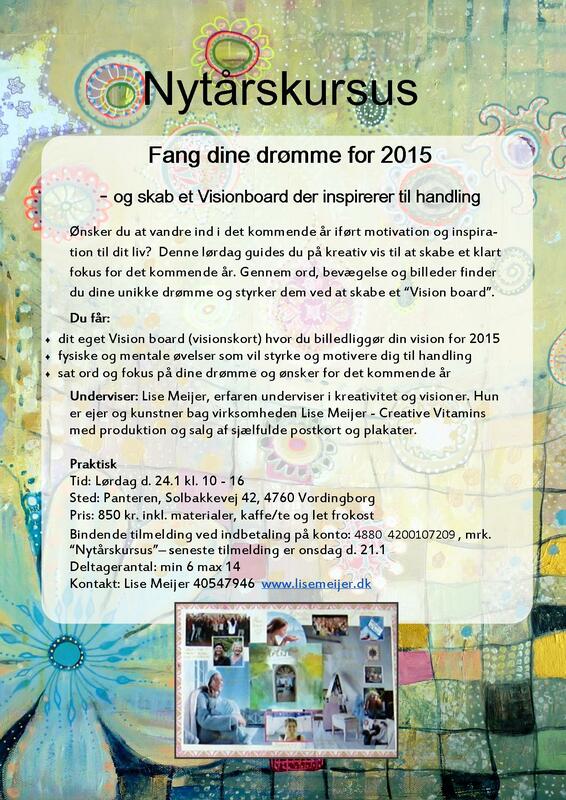 That´s when a group of ladies asked me to make a workshop and help them create their vision boards for 2015. “Oh no”, I thought, “I haven´t even created my own yet, and I honestly feel a bit stuck”. But that is the trick with these or any process. They DO work, but only if we DO them! And I had been stalling in “no action land”, which is exactly what so easily happens when what we need the most is to simply begin. And keep going with small steps. We humans can help each other so much, and sometimes asking someone for help might be the very thing that will help that person too. Good to remember! So, inspired by the request I gave it a go with my own visions. It helped. I found out several things that I had not seen, that explained the resistance I felt. I saw that I needed to give myself permission to search for new ways – with business and with other areas of life – to really ask again from scratch what route it I wanted to take, and to be willing to make some changes. To say more boldly NO to things that no longer fits, even if it looks like it will generate an immediate income. To insist on working from a core of joy and service, rather than pushing myself into areas that clearly steals my energy. To dare not meeting expectations, my own and others. To dare listen, every day, to my intuition, which has proven over and over again to be a most trustworthy tool. Slowly but steadily the fog lifted, and I began feeling that childish anticipation again. If I can, I know you can too! 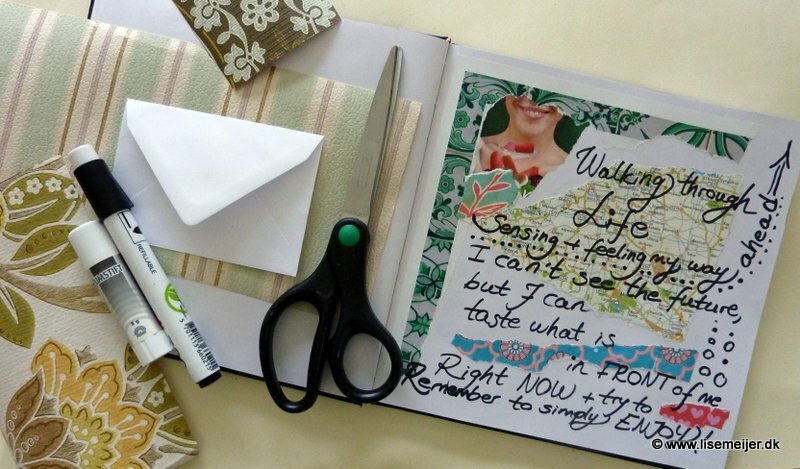 You can read more about creating a vision board RIGHT HERE. Till soon, love from Lise. If you are in any way like me, you had a hard time learning how to make things happen in this world. I know some people are born as “action-people”. (If you are one of them, know that I admire you deeply!) I never understood how they made things happen so easily. With “things”, I mean everything in life, from creating a beaming home or a fulfilling work life to a blossoming social life or any other thing you want that takes ongoing action. I did all those things, but not really with full boost. I knew how to feel my way ahead and find my own inspiration which is also incredibly important qualities in life. I just didn´t get the concept of how ideas became reality on a bigger scale. Creativity + focus + actions (even the smallest tiniest ones) = making things happen. Quite simple actually, but only if you DO it. I know that first we must set our heart´s compass for things that bring us joy and begin pursuing some of them with our creativity. And then add focus, over and over again. And when we have done that even just a bit, begin to take some of the many tiny actions steps that automatically will reveal themselves as possibilities when we work with our joy and creativity. Then things begin to happen. Yes! Here it is: Creativity and focus. Added tiny actions. And things begin to happen. 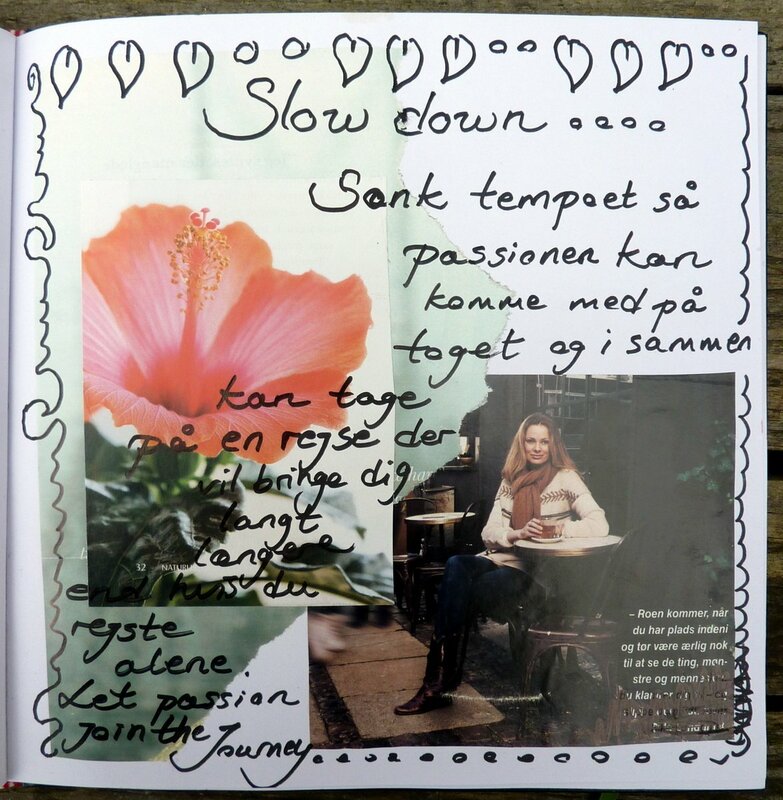 This spring I will begin teaching a course here in Denmark together with a wonderful coach and storyteller, Marianne, about how to find your vision, stay focused and begin making actions in that direction. 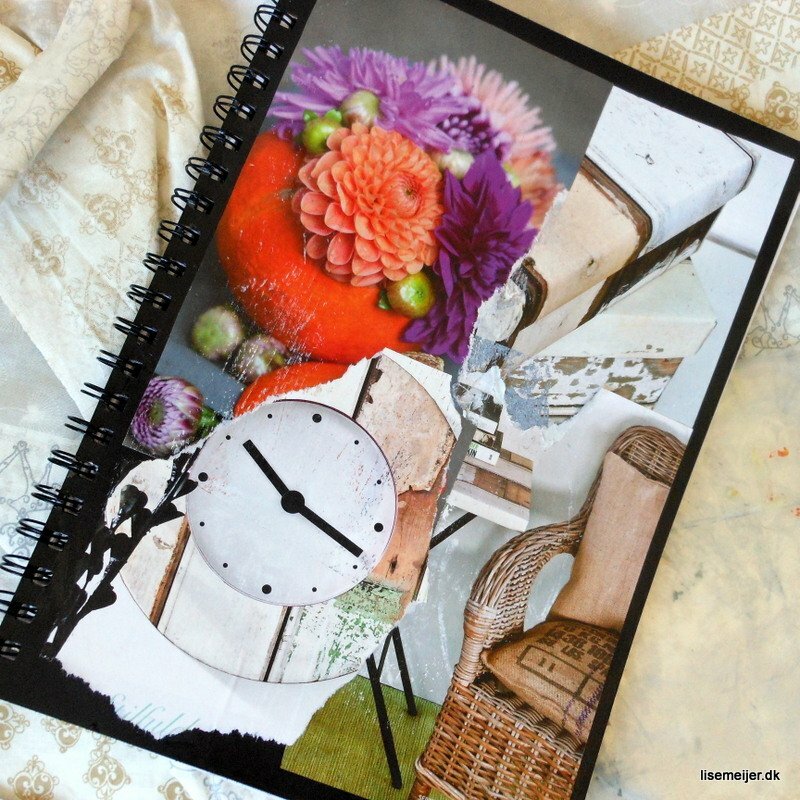 And it´s all evolving around a…..wonderful creative scrapbook! 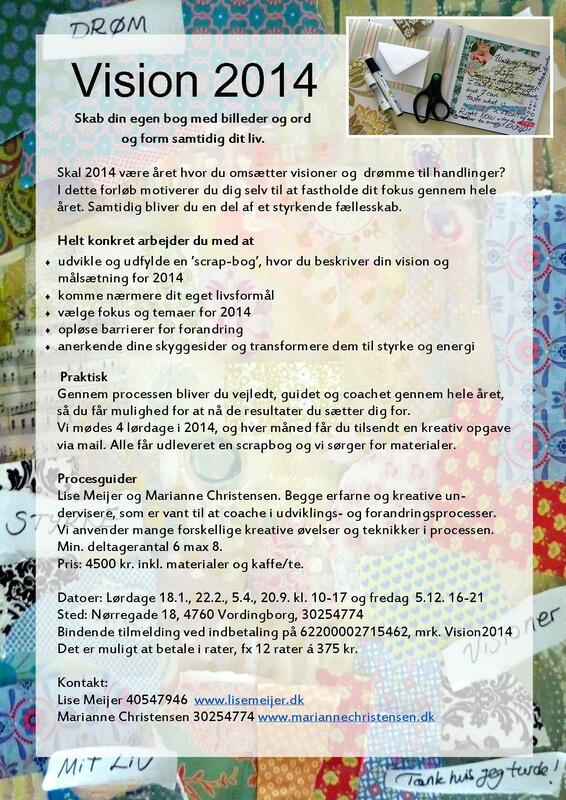 So, danish people or adventurers from around the globe, the invite is here and it begins 18th january. Are you in? Would love to journey with you! And if you live too far away and still would love to work with these things, I am very open for international invitations, just saying! So, you are warmly invited and there are still open spots! I am going to collaborate with a blessed storyteller and coach!!! Marianne Christensen and I will be teaching a brand new course about taking responsibility for our dreams. “Vision 2014” involves scrapbooking, storytelling and the power of finding your passion and creating a vision of it in your own book. A powerful combination of creativity and determination. I know how working with our visions can cause true transformation in our desired life direction. And I can hardly wait, it is going to be good! You may not speak a word danish or live anywhere nearby. But I simply can´t help sharing this visual invite with you anyway. To make up for the language/placement issue, I promise to give you a few tips and hands on inspiration of how to make your own new years process at the end of this post. And if 2014 is going to be the year where you commit yourself to reach your goals, and you DO live nearby, I recommend you sign up NOW! For years I had a special affair with New Years processes. I recall celebrating new years evenings as a teenager with my best friend, my notebook and candle lights whilst everyone else was out partying wildly. I loved it. And continued to love it to this day (even though I caught up on the wild party-thing when I got a little older, happy about that too!) Love the opportunity to cap one year and welcome a new by making conscious what was, and envisioning what lies ahead. Later I learned more about the power of visualisation and cloaking our dreams with actual visible pictures, and began to incorporate it in my own process. And later in workshops for others. 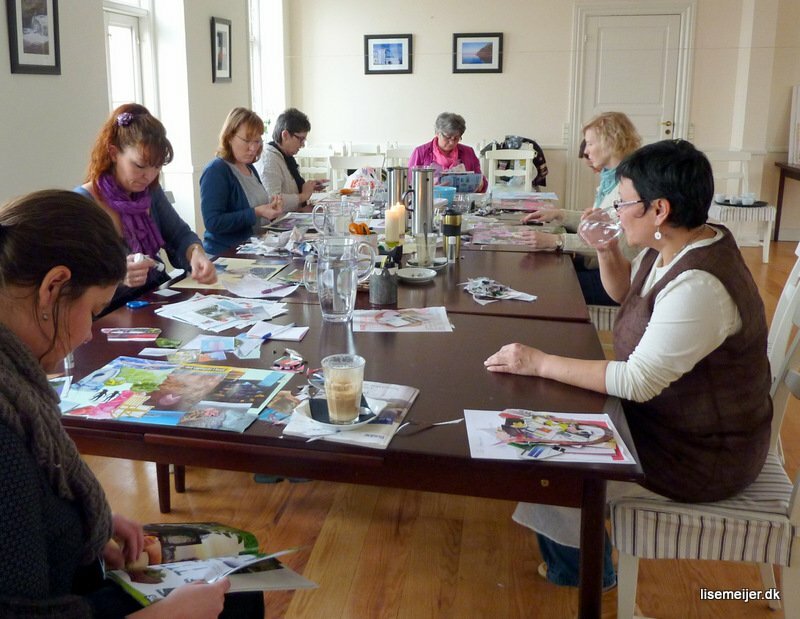 Vision-board-workshops as new years preparation is a very powerful and a truly helpful process. Like telling ourselves the story of our possibilities in a way that we can see them even when we thought we forgot. Because they are visible on a map right there on our own wall. And that opens the door to actually believing it. Like promised, here´s some tips for making your own new years process. And if you do live nearby, I highly recommend joining our workshop. It could just be the extra assistance you need in meeting your own dreams in 2014. Contact me and I´ll send you the details! A free printable New Years Kit from “Do What You Love” that I found very helpful to keep focus. Important to not stress about this. It´s not about getting it perfect. It´s about taking a conscious glance at a year gone by and sending out your wishes for what you would love to see in the year that is knocking on our door. Yesterday I was teaching a workshop called “Creative new years clearing”, a day full of exercises designed to say goodbye to last year and entering the new year with your visions and goals crisp-clear in your mind and heart. There was a group of wonderful, brave woman who had carved out time and investment to move into year 2012 more ready, closer to themselves and their innermost wishes. 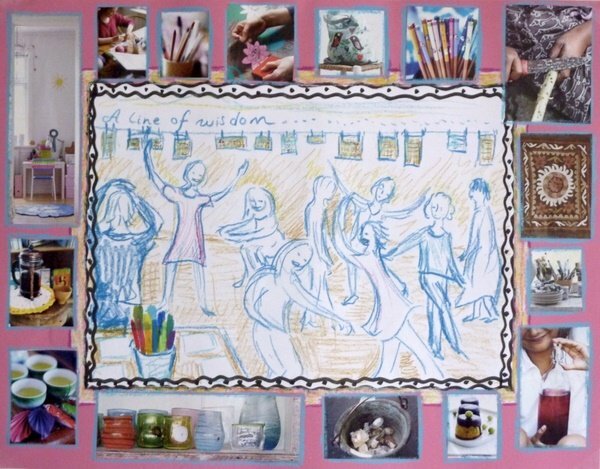 My vision here: Teaching workshops about using creativity to create a more fulfilling everyday life. Now, a few years later, I have taught many workshops using all those tools I dreamed about, and it still feels so right, so fulfilling. To me a visionmap is like a road map, put out in the open so that my visions can better find me. Did you ever think of that; there may be billions of visions out there, looking for direction, for a home. The vision-map shows the direction so the vision can find us. Our actions give them a home. Both is needed, the vision-map doesn´t do it all alone, but it plays such an important part, and I know it works. Even on days where I have doubts (and they come to all of us, try to remember that when you feel alone and doubtful, absolutely everybody experiences doubts, especially when you set out to do something out of your own comfort-zone!) then the vision-map can sort of bypass the worst of it, because: I can clearly see my vision, it is hanging right there on my wall. And the vision knows where to find me. PS: if you live near Roskilde/ Copenhagen, you may want to come by for the opening of my exhibition, coming tuesday. Would love to see you there! 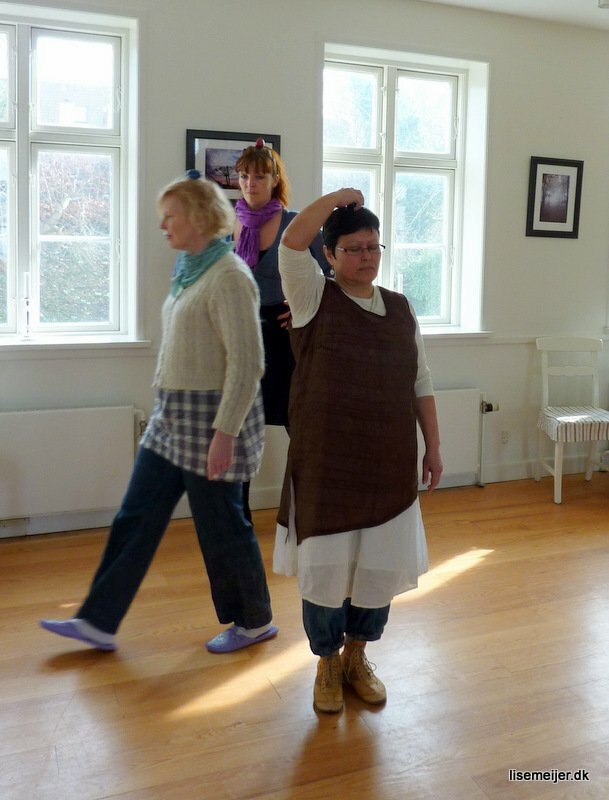 A dear soul resently asked me if I would teach a workshop around new year. She would organize the whole thing, I just had to cencentrate on the day itself. A workshop-day for woman where we create space and time and process to cast out the mind for our wishes for the year to come. Creative vision-workshops is part of what I do, and I love that part and would like to grow it. So I said YES! and sent her my opening lines for the course. About a week later, she phoned me back, and told that she had found the hall for the workshop and sent out the invitation-mail, and had the first participants sign up already. Then she read the invitation to me. It was so great! I would definately join that workshop. She used most of my words. But she added something. She made it sound just so simple and profound and really delicious. Clearly, she was not trying to sell. She just really wanted it to happen. And that, of course, makes the best PR in the world. Great to read if as part of another persons setup. And what a relief for me to not have to sell my own workshop this time! I have been asking for exactly that: The oppurtunity to focus less on PR and selling and more on content/creating stuff. I am so grateful. We don´t all have to know how to do everything. I still like to do some PR work, but not all and not alone. We can do so much more when we work together. I want to deliberately embrace that. I want to be part of teams where we all do what we love to do, most of the time. Thank you, creation, for a wonderful world with so many different people, each single one a gem of skills and possibility. 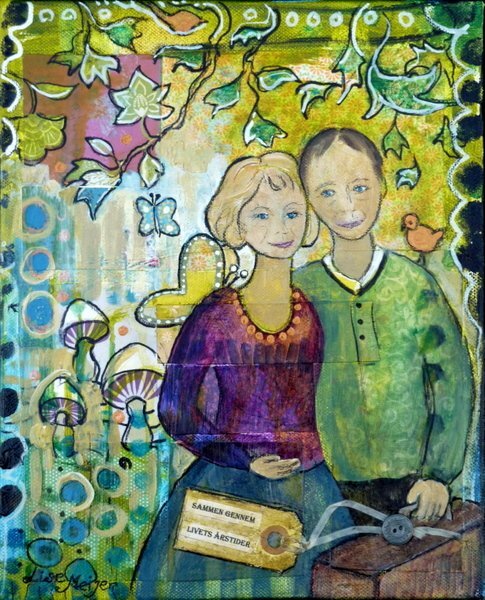 “Together through the seasons of life”, mixed media on canvas. The painting above was made for my father and his wife. I am so grateful that my father found the love of his life – again, after my mother died. They are truly great together. This weekend they celebrated their 12,5 years anniversary which we call “copper wedding”, with the whole family, grandchildren etc. So great to see everyone and celebrate love through all weired and wonderful seasons of life.